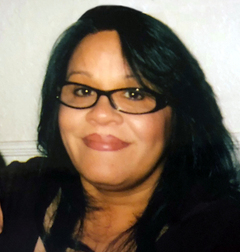 Annadeen Lopez, 54 passed away Friday, September 28, 2018 in Lubbock. Services for Ms. Lopez will be 10:00 am Tuesday, October 2, 2018 at Our Lady of Guadalupe Catholic Church. Burial will follow in Peaceful Gardens Memorial Park under the direction of Broadway Funeral Directors. A rosary will be held 7:00 pm Monday, October 1, 2018 in The Chapel of Broadway Funeral Directors. Visitation will start Monday at 8:00 am. Annadeen was born June 2, 1964 in Lamesa to Juan Campos & Gloria Hilburn. After getting her GED, she went on to receive her license to become a CNA and worked in that field for many years. She was a jokester and enjoyed life, often dancing and having a good time with her family and friends. She loved her family dearly and was known for protecting them however she could. She will truly be missed. She is survived by her daughter, Jessica Lopez of Lubbock; her son, Sonny Lopez of Lubbock; her father, Juan Campos of Houston; three brothers, John Briones of Lubbock, Gilbert Campos of Midland, Willie Briones of Florida; four sisters, Nora Briones-Baca, Mary Lopez both of Lubbock, Gloria Peterson of Midland, Tina Ramirez of Houston; six grandchildren and a host of nieces and nephews. She is preceded in death by her mother Gloria Hilburn and grandmother Stella Hilburn.